Load your images into the library by selecting File > import > import to library. Choose the images you want to use then click open. Drag your images on the stage. I am making the contents of my scrollpane horizontal, so have lined my images on stage horizontal. You can make the content of your scrollpane vertical, if you wish. Don’t worry if your images go over the edges of the stage. Select all the content by selecting ctrl + A. Add the scrollpane component to the stage by selecting window > component > user interface then drag the scrollpane component onto the stage. Using the selection tool (v), select the scrollpane components parameter tab and change the content path to “images”. 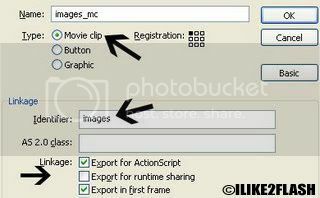 Using the image_mc movie clip on the stage as guide drag your scrollpane component to an appropriate size. Once you have your required size. Delete the image_mc movie clip from the stage. You should now only have the scrollpane component on the stage. Test your scrollpane Ctrl + enter. You should now have a scrollpane component with scrolling content. If you wish you can remove the border from the scrollpane. this is the first clear and simple tutorial to use scrollpane i can find, it works perfect in Flash CS3. Very nice. Thank you. F8 does not work on my laptop, have to check my settings. otherwise, many thank you's. thanks for sharing the tutorial. i was wondering if you know how to do this in as3? i know that the identifier is no longer supported in as3. how do you call the (non-text) content? @anna Try selecting a actionscript 2.0 file when creating a new document. how would you do it so that the scrollpane has thumbnails, where each thumb nail could be a trigger for a higher resolution picture to load above it? Thanks for great tutorials, especially to get the frame from the scrollpane! Problem though - I have a map with both horizontal and vertical scrolling. I want to have the content default to be in the right lower corner, and not on the top left corner when loaded, eg. scrolling will be up and to the left if you want to see more of the map. Is it possible? I don't think you can change the default location of the content.